Great Ayton is a pretty village with the River Leven flowing through the centre making it a great place for ducks and moorhens. Today we saw second time round chicks. This village has two greens, the low green next to the river where there is plenty of parking and is popular for picnics and the high green in the centre where Captain Cook’s statue stands. Captain James Cook, the navigator and explorer, spent his boyhood days here and attended the Postgate School which is now the schoolroom museum dedicated to him. He was born in 1728 and after working his way up through the ranks in the merchant navy he volunteered for service in the British Royal Navy where he had to work his way through the ranks again. In 1768 he travelled to the Pacific Ocean to record the transit of Venus across the sun. He was also involved in two more voyages to the southern hemisphere and spent eleven years sailing around the Pacific Ocean. In 1779 on his third voyage he was killed in an altercation in Hawaii. The monument in memory of him stands on Easby Moor along with the Cleveland Way and can be seen for miles. From here the views are fantastic. Roseberry Topping is a very distinctive hill with its half-cone shape summit and jagged cliff and stands at 320metres (1,050ft). Roseberry Topping is the result of sandstone laid down in the Middle and Lower Jurassic periods and is the earliest sandstone to be found in all of the National Parks in England and Wales. Its unique conical shape is the result of the hard sandstone cap protecting the underlying shales and clays from erosion by the rain, wind and ice. The summit once resembled a sugarloaf until a geological fault and nearby alum and ironstone mining caused it to collapse and leave the massive scaring which you can see today. The views are fantastic and on a clear day you can see as far as the Pennines. We park by the side of the River Leven and walk to the road bridge and cross over the road following the river and into the town. We then follow the road round to the left and take the road to the right signposted Little Ayton and station. On reaching Little Ayton we turn left just before the bridge onto a track and walk to the end then keeping left we go through the farm, here there is a tearoom and play park, and head straight forward not on the path to the right. We then go over a railway bridge and then the track bears right we follow this track going by a small wood then through two gates. Here we turn left with a wall on our left and follow the path up to Ayton Banks Wood where we go through another gate. We now go very steeply up the middle path to Captain Cooks Monument. At the monument we take the Cleveland Way on the left heading towards Roseberry Topping in the distance. We walk down hill until we come to Gribdale Gate car park and picnic area here we take the path, still the Cleveland Way, opposite and slightly to the right. We now go uphill with a wood on our right and then after the second wood on our left we turn left following the stone path steeply down then steeply up to the summit of Roseberry Topping. After admiring the views we then make our way down to an obelisk to take a look. We now go back up to a fence and go over a stile then through two fields. We go through a gate and turn left then right. We then go through another gate and walk along side some trees and a quarry. We then turn left and then go over a stile on our right and then follow the path down through the wood. We now go straight ahead going over the railway line, over a field, then a narrow tree lined lane and through an iron gate onto the road at Great Ayton. We turn left and follow the road back through the centre to where the car is parked. This is a moderate to hard walk. There are some very steep inclines and declines. This walk can be done via a number of ways. Approx 7.5 miles for the whole walk, Great Ayton-Captain Cooks Monument-Roseberry Topping using OS map OL26. OR from Great Ayton to Captain Cooks Monument and return the same way is approx 5.5 miles. OR from Great Ayton to Roseberry Topping and return the same way is approx 5.5 miles. OR from Gribdale Gate car park up Dikes Lane on Easby Moor, Captain Cooks Monument return is approx 1.75 miles and Roseberry Topping return is approx 3.75 miles. Great Ayton is in the North York Moors, North Yorkshire. From York take the A19 towards Middlesbrough and take the A172 to Stokesley. By passing Stokesley turn right at the roundabout onto the A173 to Great Ayton. There are toilets in Great Ayton. For refreshments in Great Ayton there are plenty of pubs, cafes, tea rooms, a fish and chip shop, shops and B&B’s etc. Just a note to say thanks. Fantastic site. Loved your video clips. The walks are a wonderful collection. 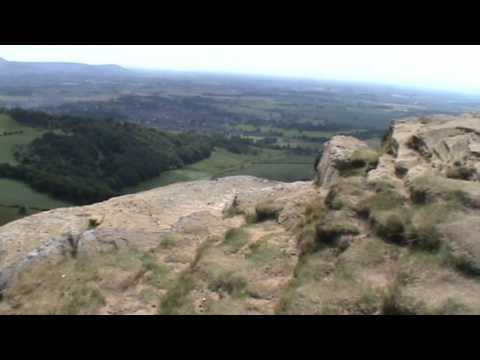 We are off to try Captain cooks monument and Roseberry topping tomorrow. Absolutely lovely hearing your voice on the clips. Keep up the good work. I will deffinately be following your exploits now. Thanks for sharing all your hard work. Brilliant!